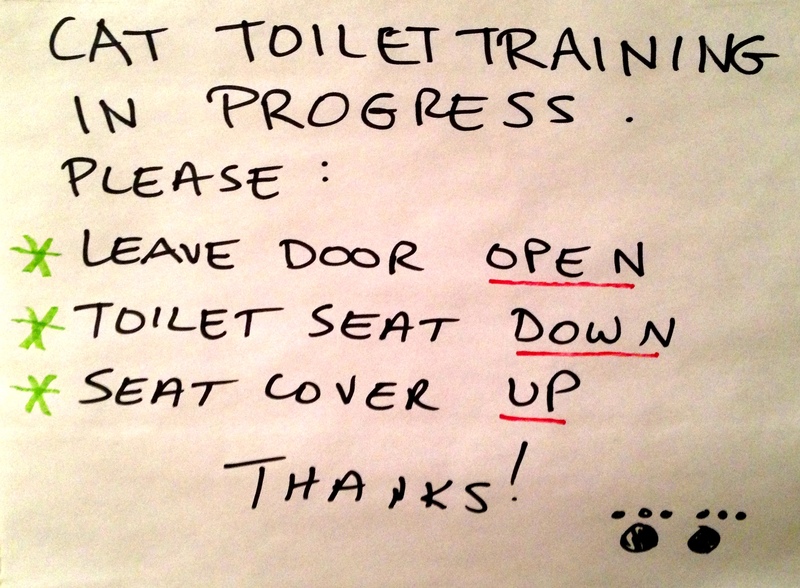 I used CitiKitty Cat Toilet Training Kit from Amazon (about $30.00) to toilet train my cat. The inserts, while perforated, are a pain in the arse to remove. I suppose that is a good thing since you don’t want them breaking while your cat is standing on them. I ended up using an x-acto knife. It’s basically like opening any toy sealed in hard plastic from Toys R Us so prepare to be annoyed. I placed Miko in the cat litter on the toilet seat and he went pee right away. He spent a good 5 minutes covering, but not overly exuberant with his pawing. He really liked the catnip in his litter. Tried to eat it (before he went pee). Just fed him so we shall see how he takes to pooping with less litter. I’m trying not to hound him and trying to clean up quick after him so it’s a clean area without smell. Still waiting on Miko to go poop. He’s not taking the bait. Maybe I should shake him a little. Just kidding. Guess we will see when he really needs to go. It’s after midnight and I need sleep so not while I’m awake, apparently. Two pees and no poops. Getting a bit stressed over that. He’s been eating and I have plopped him on the seat a few times and given him plenty of praise and affection, but either he’s holding it or he just doesn’t have to go yet. He’s a real smart cat and it’s hard not to expect a lot from him. I just need to remind myself to take it super slow. Already 9:27 pm so I may miss the poop if it happens. I’ll most likely be asleep. I keep the doors closed so no pooping in our laundry. Nate used the bathroom and put the CitiKitty tray down, but not the toilet seat. If Miko had jumped up and that tray went flying training would have been over before it even started. Luckily, Miko didn’t use the bathroom and I caught it first. Wheww!! Guess what I woke up to? Poops! I’ve never been so glad to see my cat take a dump! Right spot, no accidents, and me not around. I had barely cleaned the seat and put new litter in his tray when he hopped up, interrupting me, and went pee. Ohthankgoodness. Ron and I went out to dinner and when we got back, there was a pee present waiting so that was cool. Yes, I’m obsessed with my cat’s bowel movements. The cat didn’t have a surprise for me this morning, but after an hour or so of me being awake, he went pee with no problems. Still waiting on a poop, though. Seriously, I think he’s doing this to me on purpose. Before noon, after he meowed at me, I wandered past the bathroom and he’d left a big present exactly where he should have. And he discovered where I left the Ziploc bag of catnip and proceeded to attack it, trying to get it open. But not after jumping in the garbage can, which was where I mistakenly put the wrapper that held aforementioned catnip before putting it in the Ziploc. I’ve since put the catnip in a sealable container and far away in my office. It looked like someone had stashed a bag of weed in my bathroom drawer so that is probably a good thing. Almost midnight and looks like no more bathroom trips for Miko before I hit the hay. I’m pretty sure there will be a surprise waiting for me in the morning, though. Woke up to a big pee this morning. Not too much litter on the floor either. Another big pee just before 1. No other activity for the rest of the day. Well, there was a nice big poop waiting for me this morning (where it should be) and a surprise on the couch. The cat threw up all over Ron’s side. So I think he was saying he still loves me best (not puking on my side), but that he’s not above barfing any place he likes. Mental note: teach cat to puke in toilet. Anyway, it looked pretty gritty so I think it was due to me putting catnip in Miko’s litter. He goes so crazy for it, I guess he was chewing down on litter, too. So that’s bad. Pretty glad we got leather couches and not suede. So, no more cat pot, I guess. He’ll just have to make do with plenty of praise from me. Which he got. As I was cleaning up, he hopped up on the sink and watches me and, again, the new litter isn’t down more than a minute before he’s on there going pee. So I think he holds it while waiting for a fresh bit. There’s probably not enough litter in his mind to do a second run. It is an adjustment, I’ll admit. And I’m real glad I’m home to pay attention to what he’s doing and clean up quickly afterward to keep it as pleasant as possible for him. I remove one of the inserts on Sunday so it will be interesting to see how he handles it. Woke up to a big pee. Cleaned his tray and had a back-to-back pee/poo presents. He did a jump from the sink counter to the toilet tray, which was interesting. Won’t be doing that in a few weeks unless he’s looking for a bath. But so far this week no accidents so looks good for the next phase tomorrow. I can’t imagine he will go again today, but he may later on tonight. Present waiting as usual. Go, Miko! So I cleaned up and as we were getting ready for church, I cut out the first insert and hope and prayed Miko would use the toilet before we had to leave so I could monitor and praise as needed. He checked it out and spent a good five minutes peering into the hole. I’m like, “Great job, sweetie, it’s a hole now pee in it!” Before I stressed him and myself out I patted him several times, cooed at him, then left. And sat in the living room with one ear trained on the bathroom. Since all other doors were closed, when he wandered that way again I was on high alert. No poops yet so we will see how that goes. Near midnight and only the one trip to the bathroom that I mentioned earlier. Woke up to poops and a pee in Miko’s litter. He’d pawed his litter enough that just the poop was sitting there right on top, but nothing was on the floor. Go, Miko! I was so proud. If I could high-paw him, I would. Maybe I’ll teach him that next. Again, he went pee shortly after I changed his litter. Oops. I slept in. Nate had flushed the toilet so I don’t know if Miko had wicked good aim or just didn’t poop. I did clean up when I got up and heard him meowing in the bathroom, but I couldn’t tell if he’d gone potty or just kicked his litter through the hole, freaked out, and gave up. I guess time will tell on that. Got my eyes peeled. Big pee and most through the hole. A little later he went poop with me right there and all but one poop made it through the hole. He was a bit put off by the sound of poops going to the water, but it didn’t deter him and he didn’t freak out by the sound. Nothing like a hysterical cat running through the house, terrified, pooping along the way! Bit more stress today as there was a lot of meowing around the toilet again. Not stricken, but more help or unsure. He managed to poop again, but I made the mistake of being there with him again and I don’t want this to be about me holding his paw every time he needs to go. It really is hard to see if he went or not between the good aim and the pawing litter into the hole. I suppose that is preferable to actually seeing excrement or urine on the white floor. When I got back from my meeting, Miko had pooped and peed all by himself without me. So, yay! No stress there. In just a few days we go to the next size. Cleaned up this morning knowing he went pee, but again either his aim is stellar or he’s holding it in. Caught him on the toilet as I walked by and stood there peering into the bathroom darkness. I wasn’t sure if it was a cat shape sitting on the toilet. When he hopped down I realized my mistake. Probably thought I was a stalker. He ended up not going. Argh. My bad. His litter is clean so we will see what I wake up to. 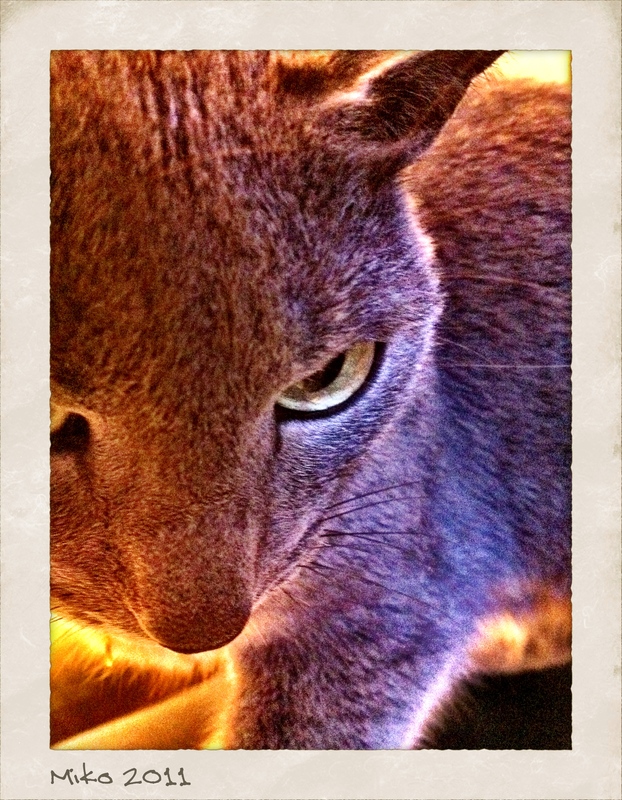 Hopefully not a paw at my throat warning me never to watch him during his private moments ever again. Another successful day. Miko is a champ. He’s like the Rocky of CitiKitty. Apparently Nate discovered poops and pee in the toilet this morning. Actually, there was very little running outside to wash his tray today. I just had to replenish litter. He did a pee, I cleaned, then he hopped up and pooped right in front of me. I’m like, “I thought I’d traumatized you. I see now you enjoy an audience.” Then Miko watched in fascination as the toilet flushed it all away. Like pretty water magic that he wanted to drink. Ew. Not antsy or jumpy about the flushing at all. He’s doing great, too. Worked like a charm today. Only one trip outside to wash the tray with the hose. I think the neighbors are beginning to wonder about me. Woke to shuffled litter so I assume Miko went. I cleaned his tray and refreshed the litter, and he went pee almost immediately. A few repetitive quiet meows then he did his thing on the toilet. I heard the plop, plop, plop. I think he prefers me watching. Great. I broke my cat. Obviously more of the same or I would have written a small novel about it. My cat is freaking brilliant! And his bowel movements are super regular, too! Today is the first day on the last rung without cat litter. I swept, cleaned the toilet, washed the insert. So we will see how it goes. The other day Miko was kind of needy and whiny. I may have created an attention-seeking monster with all the high praise I give him after he goes. He also seems to prefer that the toilet is flushed immediately after his first trip to the toilet for a pee so that it’s nice and clean for his poop. No insert, nothing. Nothing but a toilet seat and my cat. He’s meowy, but no problems. PHEWWWW!! That’s all she wrote, folks. It’s been barely a week and I’ve already acclimated to never ever ever scooping a poop again.